Whether a veteran of the backcountry trails or a newcomer to its enchantments, now is the perfect time to visit or revisit the Lower Manzana Trail in the San Rafael Wilderness. Drenched with rain in recent weeks, the San Rafael Wilderness will be at its most hospitable and beautiful until April and May, and at present it’s a magical land of rushing rivers and greens beyond belief. What’s more, the trail has gotten some recent TLC from Los Padres Forest Association volunteers. This popular trail travels 8 miles along Manzana Creek to the Manzana Schoolhouse, likely the most traveled-to weekend destination second to the Manzana Narrows on the Upper Manzana Trail. However, this route describes a recent late January trek with a few friends beyond the Manzana Schoolhouse to the fabled and seldom-seen Sisquoc River, returning back over the mighty ridges of the infamous Hurricane Deck — all in a watery, wearying, wonderful weekend. We set out on Friday night under a new moon, the wilderness as dark as could be. Though our destination, Coldwater Camp, was a mere 2.8 miles from the trailhead, the Manzana crisscrossed our shins three or four times, providing a unique and chilly thrill to the already adventurous activity of night backpacking. The ambient temperatures were near freezing. After a brisk journey into night, we arrived at the wide-open meadows of Coldwater Camp and awoke the next day to a frosty expanse of grass and oaks. Had we been up for a few more foot-soakings, Horseshoe Bend, only another 1.6 miles, would have be another great first-night destination, with its particularly resplendent, shady meadows, and views of the sandstone domes of Castle Rock to wake up to in the morning. 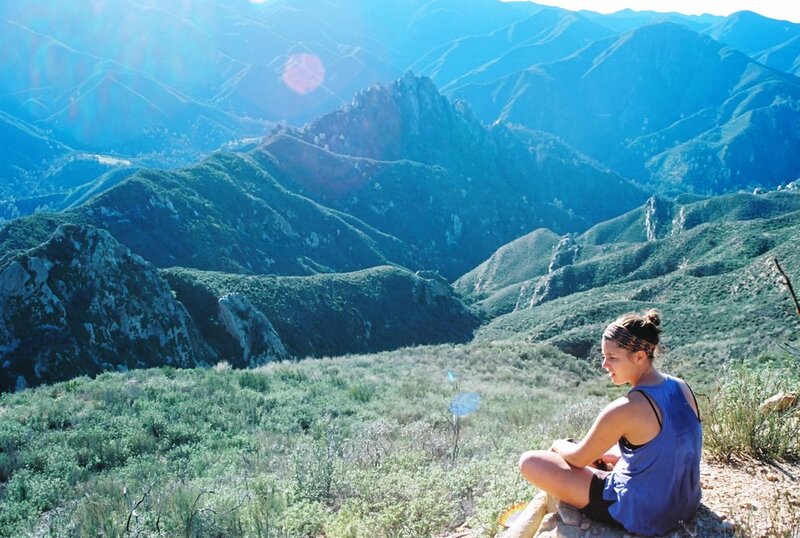 This region of the trail, as it passed from Coldwater and Horseshoe Bend, was Manzana traveling at its most delightful, as namesake bends in the river shimmered blue under Castle Rock’s white crags, towering above us in a scene we could never imagine as belonging to Santa Barbara’s backyard. As the trail moved under the shadow of Zaca Ridge and on the verge of private property, the trail became a wide, beaten dirt road dotted with the occasional “no trespassing” posting. 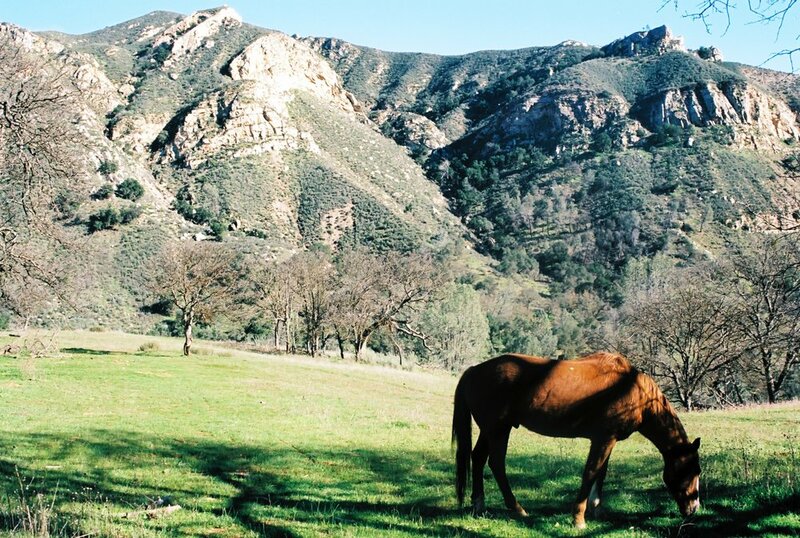 This is a land of many uses, as you’ll see at just over 6 miles from the trailhead, when you come to the cabin of one Charles William Dabney, a wealthy Santa Barbara sportsman who leased the land and built a cabin near his favorite trout fishing spots back in 1914. The cabin has since been used as a Midland School destination for students until the mid-century, when it was designated a historical county landmark. Between here and Manzana Schoolhouse, about 8 miles from the trailhead, we witnessed just these kinds of varied approaches to this wild land. We beheld in one vista the curving Manzana Creek, a private ranchland, a former pioneer settlement, the mountainous backdrop of a private resort (Zaca Lake, once a holy site for Chumash), and a federally designated wilderness left to unfold naturally, with traces of societies left behind. Where the Manzana and the Sisquoc meet was once part of a series of settlements along the Sisquoc, a land that proved too unreliably nourishing and too unforgivingly hot for many Westerners who sought refuge here. If you have three full days at your disposal and not just two, the Manzana Schoolhouse would be a great first-day destination. I had hardly ever seen a grass so green and a meadow so peaceful and beautiful as the ones surrounding this site overlooking the emerald green hills of Horse Gulch Canyon and the almost pyramidal white face of Wheat Peak. Many people end their trips here, understandably so. Far fewer, it seems, go very far beyond, as the trail along the Lower Sisquoc is comparatively brushy and hard to follow. Shorts are inadvisable for this 4-mile stretch to Water Canyon, beautiful though it is, as thorny chaparral will prick your legs for the next mile or so. This is wide-open country draped in beautiful moss and haunting oaks, and the sight of the serene Sisquoc is a welcoming one. 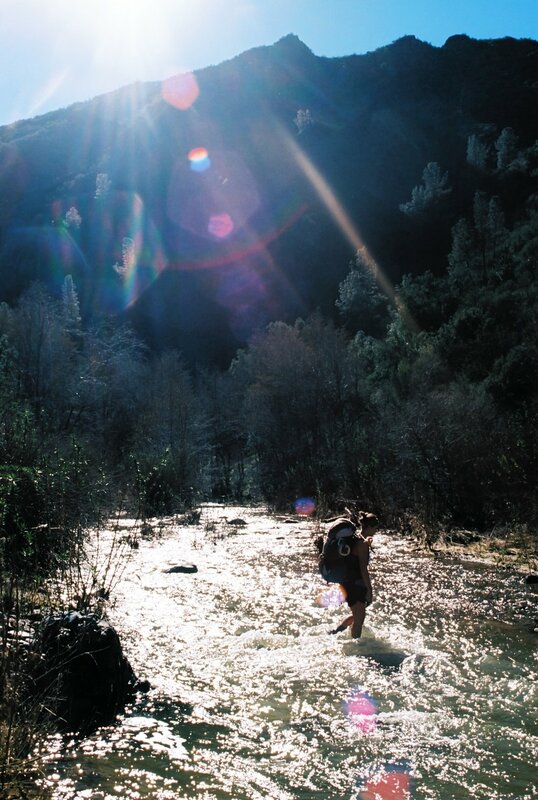 A federally designated Wild and Scenic River, the wilderness length of the Sisquoc has been never been filtered through city light pollution and maintains an untouched mystique as it winds lazily between the Sierra Madre and San Rafael ranges. Being so far from paved road access, the trails are less maintained and become harder to follow the further you go. We met the Sisquoc River at a beautiful crossing with surprisingly dramatic geology. After this, finding the trail here became difficult; it trends toward the right, through an old, dilapidated corral fence. As the sun began its descent to the horizon, we traversed a wide meadow mesa graced with the occasional oaks. Underneath the shadow of Bald Mountain and Hurricane Deck, this portion of the Sisquoc trail was a peaceful slice of heaven with an expansive feeling of open freedom. The trail descended to a broad meadow, the site of an old homestead. Evidence of decades-old land use, long-forgotten, rusted along the way. A topographic map like Bryan Conant’s San Rafael Wilderness map is critical to navigate your way along the curves of the river, as the trail seems to disappear and reappear at points. We faced navigational difficulties just as the sun left us, and were left to ford through waist-deep crossings by the light of our headlamps, almost more like spelunking than backpacking. 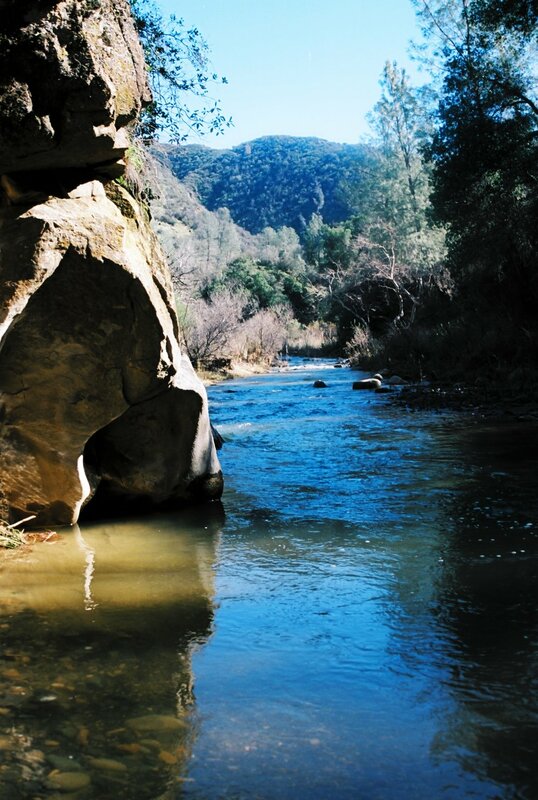 The most reliable way to find Water Canyon Campground was by seeking out the convergence of the Water Canyon tributary with the Sisquoc, appearing on the western bank of the river. The very pleasant camp is across the river underneath a beautiful sentinel oak, complete with a set of watchful deer antlers hanging in the canopy. Our final day was set to be a daunting one: We would travel back 4 miles to the meeting with the junction with the Hurricane Deck Trail, climb over 2,200 feet across 4.4 miles to meet the Potrero Trail, then descend 1,700 feet down 3.2 miles to our final 1.3 miles back to the car — in all, about 13 miles of journeying. This route is only for the truly hardy and adventurous, and it will test the spirits of even excellent hikers. It’s not just the physical hardship of the switchbacks that scissor through the oaken shade up the first ascent, or the beating sun which, even on a relatively mild winter afternoon, felt too hot at points, or the fact our legs had already taken us so far and through so many river crossings. It’s the psychology of this trail: the way the trail became worryingly hard to follow on the steepest stretches, and the unrelenting rise and fall of the ridge, which, mirage-like, appears easier than it really is. Our pace slowed to a mile an hour, and one party member ventured concern about passing out. As the months get warmer, it is extremely important that anyone who attempts this know how to identify signs of dehydration and overheating. Take as much time as you need to travel this trail. But we persevered and were awarded with one of the most stunning sunset vista points anywhere in our county. There were views of the snowy San Rafael Mountains on one horizon, their snows the source of the rivers we had traversed, and the far-off Pacific Ocean on another, where eventually the waters of the Manzana and the Sisquoc end their journey and begin one anew.